Laser Hair Reduction is a relatively new technique to reduce unwanted body hair as compared to the traditional methods such as waxing, threading, razing, and hair removal creams etc. The advancements of dermatology have made it possible to do away with the side effects of hair removal for e.g. rough skin texture and thicker hair growth afterwards. Laser treatment is very effective in reducing the density of hair and still gives you a smooth skin texture. Looking for an apt Body Hair Removal Treatment in Delhi? Visit Dr. Nivedita Dadu’s clinic. Laser hair removal Treatment is equally beneficial for both men and women. It is highly beneficial in reduction of the density of hair, longer hair-free period and improved skin texture. Benefits vary from the reduction in density, improvement in texture from coarse, thick and dark hair to finer, fewer and lighter hair and longer hair free periods. It is the best way to remove all unwanted hair from any part of your body and is medically proven to give you long term hair reduction. With long lasting results, laser hair removal is better value for money compared to other hair removal methods as it requires very minimal maintenance. Your comfort throughout the treatment is ensured along with unbelievable results. 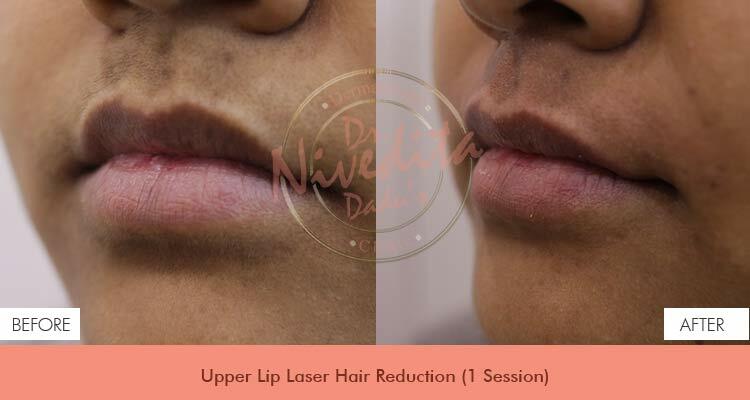 At Dr. Nivedita Dadu’s Dermatology clinic, we use lasers which are the gold standard and suit all types of Indian skin, a pain-free and quick procedure. Full body Laser Hair treatment can be successfully done within a couple of hours. This treatment can be helpful for people with any skin colour. Post- treatment you’ll be stunned to ultimately receive super-smooth and soft skin. You do not have to worry about Full Body Laser Hair Removal Cost in Delhi because, at Dr. Nivedita Dadu’s clinic, it is affordable. The laser device emits pulses of light energy that penetrate the skin and destroy hair follicles while the device’s hand piece cools the surrounding skin. Since the hair follicles are targeted in the growth phase of the cycle, hair that is in the other stages will not be affected by the laser. The sessions need to be repeated within a few weeks for up to 8 sessions, though the length of hair cycle varies depending on the body part, face usually requires more frequent treatments whereas legs and back need less frequent treatments. Also, long term results will be visible after a while due to changing hair cycles and the thickness of the follicle. At an interval of few weeks, the first three treatments are done usually. Advantages of Laser Hair Reduction are numerous. First of all, lasers can selectively target dark, coarse hairs while leaving the surrounding skin unharmed. Each pulse of the laser focuses on a particular area, thereby treating many hairs at once. The laser can treat an area approximately the size of a quarter every second. Small areas of skin such as the upper lip can be treated in much less time. While comparatively, the larger areas need longer time. Patients are advised to keep in mind that laser hair removal is a dermatological procedure, therefore you should ensure to undergo the treatment only at a certified skincare centre where the procedure is carried out by knowledgeable and experienced professionals. Also, the equipments should also be medically certified. 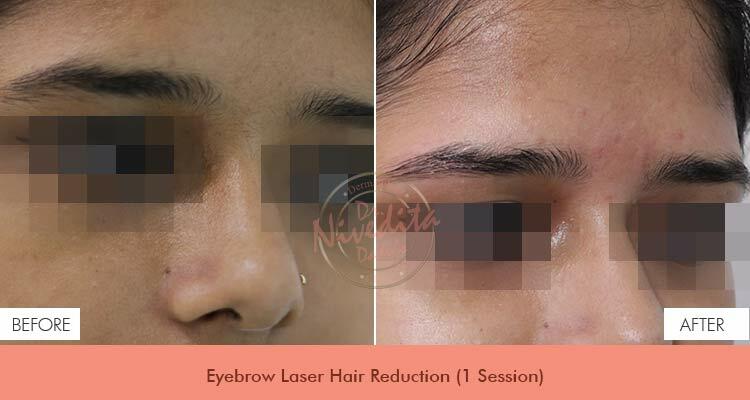 Laser hair removal procedures at Dr. Nivedita Dadu’s Dermatology clinic should not be compared to the laser hair removal services widely available in non-medical facilities from technicians with no medical training. Today, there are varieties of Laser available for Hair removal to suit all skin colours and types while earlier the procedure took longer and would show optimum results only for people with light skin tone and dark hair. A series of sessions of laser hair reduction can benefit almost anyone with a hair-free and perfectly smooth skin. There are two types of hairs present on the body, terminal, and vellus. Vellus hair is fine, downy and short and covers most of the body. Other than the palms of the hands and bottoms of the feet, it covers the entire surface of the body. Vellus hair is practically invisible and mostly unnoticeable. On the other hand, terminal hair is thicker, therefore, heavily pigmented and noticeable. This hair is usually the target of patients seeking laser hair removal and is often found in the pubic areas, underarm and leg areas. Laser hair removal for thick hair is often the most effective, as it is easier for the laser to target the melanin in the hair and destroy the follicle. Laser hair removal for fine hair is not as effective; although at Dr. Nivedita Dadu’s Dermatology clinic lasers are available that will allow even those with fine, light-colored hair to enjoy the benefits of laser hair removal. What most of the people assume is that there is only one kind of laser which is used for hair removal. There are different types of lasers available in dermatology for hair removal, which makes it important for you to understand which one is the most suitable for your skin type. Finding a leading Hair Removal Clinic in Delhi with the latest technologies? Consult Dr. Nivedita Dadu. a) IPL (Intense Pulsed Light) treatment, machines have a shorter wavelength than most lasers and are not as effective at targeting the deeper, thicker hair; they are more effective when used for the removal of thin and fine hair which are not very deep rooted. Various med-spas choose IPL's because they are multipurpose and there are many other treatments which can be carried out with its help. A few weeks prior to the first session and throughout the course of treatments, patients should not wax, epilate, or remove hair with the root using any other hair removal method. The hair needs to be in place in order to be targeted by laser as laser devices targets the pigment in the hair. After the treatment, it takes around a month for all hair to shed. Sometimes, shedding doesn’t start until about a fortnight after the session. During the shedding phase, it may look like that hair is growing, but it is actually coming out to shed. The shedding process can speed up by Exfoliating and/or scrubbing gently in the shower with a loofah. Since the laser targets pigmented hair, white, blond or red hair may not respond to laser hair removal. Since the laser works by heating up the hair follicle, there may be minimal discomfort in the form of a pricking sensation or heat felt during the procedure. The chilled laser tip and the use of ice assist in minimizing this discomfort. The pain felt varies individually, with the type of hair and the area being treated. A numbing cream may be used prior to the procedure but is not necessary in majority of the cases. Photographs of the treatment area may be taken for future comparison. Complete confidentiality will be maintained. Risks associated with the procedure include mild discomfort, reddening, bumps or mild swelling. Most of the side effects are mild and typically resolve within a week. Tweezing and waxing impact the treatment outcome as they remove the hair from the root making it less receptive to laser treatment. Bleaching the hair will also impact the treatment outcome as the hair is not black in colour. Further, shaving or depilatory creams may be used if required. Stop bleaching / threading / waxing of hair a month before your appointment. After the laser treatment, avoid excessive exposure to the sun for at least a week. Do not bleach / thread / wax the treated area in between the treatment. You could, however, shave the hair once or twice between the sessions. 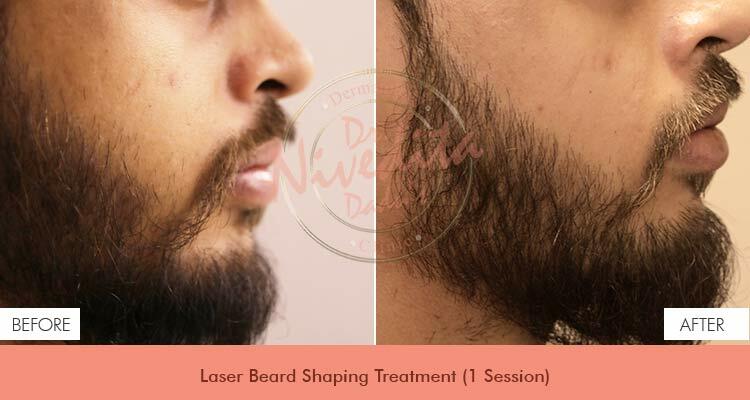 Dr. Nivedita Dadu’s Dermatology Clinic provides long term Laser Hair Removal treatments in Rajouri Garden, Delhi, for all body parts like underarms, upper lip, and chin and bikini line, depending on the patient’s requirement.